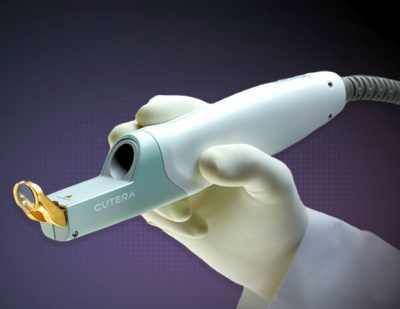 Laser vascular treatments rely on the principle of Selective Photothermolysis – the selective destruction of targeted vessels with the correct choice of wavelength, pulse width, and fluence. While the principle is well-developed, the challenge has always been to build a laser system that delivers the combination of parameters required for successful treatments across the broad range of vascular conditions. The Excel V features an innovative delivery system that allows our physicians to tailor the treatment to the patient. The advanced handpiece delivery system provides the most treatment spot sizes available on any system on the market with enhanced visibility for the physician. The system also incorporates many modern features that enhance its use in the clinic. It has been enthusiastically received by many leading laser dermatologists.